The history of the automotive industry is convoluted and confusing. Trying to determine who invented and patented what and when can be tricky, especially since some inventors neglected to patent their creations, and others were not shy about taking full credit for other people's innovations. Some inventions were built upon over time to become the engineering marvels we're familiar with today while others remain more or less unchanged since the time of their creation. Below are nine unsung heroes of the automotive industry, each of whom will make you appreciate your car in a whole new way. The main component to inventor Nikola Tesla's "Electrical Igniter for Gas Engines," a spark plug for internal combustion gasoline engines patented in 1898, has remained almost unchanged since its introduction to gas-powered vehicles at the turn of the century. Although well-known in his time, Tesla's legacy, overshadowed by his unscrupulous one-time employer Thomas Edison, is still unknown to many people. Tesla's many discoveries paved the way for modern electrical engineering; his many patents include the AC motor, fundamental devices of systems of wireless communication, and devices for X-rays. If you've ever turned a key or pressed a button to start your car's ignition, you can thank Nikola Tesla. Even the most high-tech, futuristic automobiles rely on some simple, yet brilliant pieces of technology that keep the driving experience a safe one. Consider the humble windshield wipers, two rubber squeegees that move across your line of vision in the event of rain and snow, allowing you to see and navigate the road. Mary Anderson invented and received a patent for manually operated windshield wipers in 1903. Charlotte Bridgwood invented and patented the first automatic windshield wiper in 1917. During his lifetime (1884-1962), Richard Spikes developed and patented several inventions for automobiles, including directional signals for the automobile, an automatic gear shift, a clutch for his gear shift, and the automatic safety brake. His version of directional signals was first introduced to the Pierce Arrow Town Car, a car owned for the most part by very wealthy people, and became the standard for all automobiles. In the early 1800s, John Verner Stribling, a civil engineer, mechanic, and possibly the first "steampunk," decided he needed some kind of contraption to transport materials from the railway to his South Carolina mill. He built an arrangement of gears powered by a steam engine to create a "horseless carriage," which he patented in 1882. Stribling's design would be used in the gasoline-powered vehicles developed several years later. Stribling lived to see the modern gasoline automobile, and by all accounts was proud to have contributed to its development. Karl Friedrich Benz is generally accepted as the inventor of the first gasoline-powered automobile, a three-wheeled contraption called the "Motorwagen," which he patented in 1886. But special mention should be made of Benz's wife, Bertha, who stood by her husband through tough economic times and even found money on occasion to fund the development of his inventions. In fact, to promote the reliability of Benz's newly created vehicle, Bertha and their two children drove it without Friedrich on a long-distance 100-kilometer journey over rough roads. News of her trip spread and helped publicize the Benz name and business. 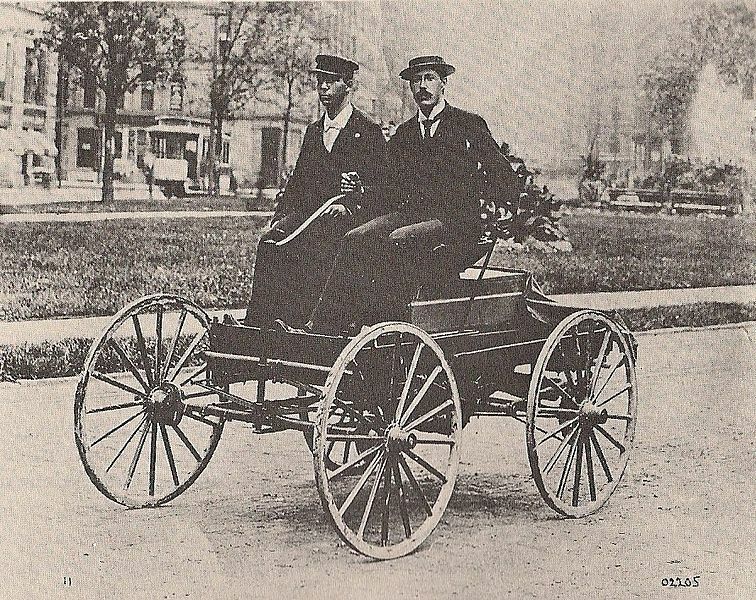 Brothers Charles and Frank Duryea were the first Americans to build a gasoline-powered commercial automobile, which they invented and drove for the first time on the streets of Springfield, Mass., in 1893, and the first to create a U.S.-based company to manufacture and sell their automobiles. The cars in their factory were built by hand and very expensive for the time. The Duryea Motor Wagon was involved in the first ever recorded car accident in which the car hit a bicyclist. Fortunately, nobody was killed. Olds invented the modern assembly line in 1901 in order to build what would be the first mass-produced automobile, the Oldsmobile Curved Dash. Later, Henry Ford would go on to improve the assembly line, adding conveyor belts to help speed up work. Interestingly, Olds claimed he built the first steam-powered automobile in 1894, unaware perhaps of the aforementioned John Stribling's 1882 patent. Now we get to one of the most important inventions ever made for the automobile: the car radio! The self-taught inventor William (Bill) Powell Lear not only founded the Lear Jet Corporation, he also invented the car radio and developed the 8-track, an audio tape that was widely found in cars back in the 1960s and 1970s. Inspired by the work of Nicola Tesla, Lear studied wireless technology as research for what would become a radio that played in a traveling automobile. Lear and his friend Elmer Wavering designed and built the first car radio, deciding together on a cross-country trip to give it the name "Motorola." Around the year 1478, the great Leonardo da Vinci sketched out in great detail a plan for a self-propelled vehicle. Researchers believe it was designed to be a fun, special attraction for festivals, not a car that could actually transport passengers. The vehicle, a three-wheeled wagon with no passenger seat, is propelled with wheels that are initially rotated opposite of its intended direction, winding up springs that in turn move a variety of clock-like gears, much like a wind-up toy. Until recently, this was one of da Vinci's many ideas that remained hidden in his sketchbook.